If you’ve bookmarked this page for current gigs, you need to move into 2015. New dates can be found here. Mon 2nd Jun – Crash Test at the UCBT in L.A. Wed 4th Jun – Nerd Meltdown at Meltdown Comics in L.A. 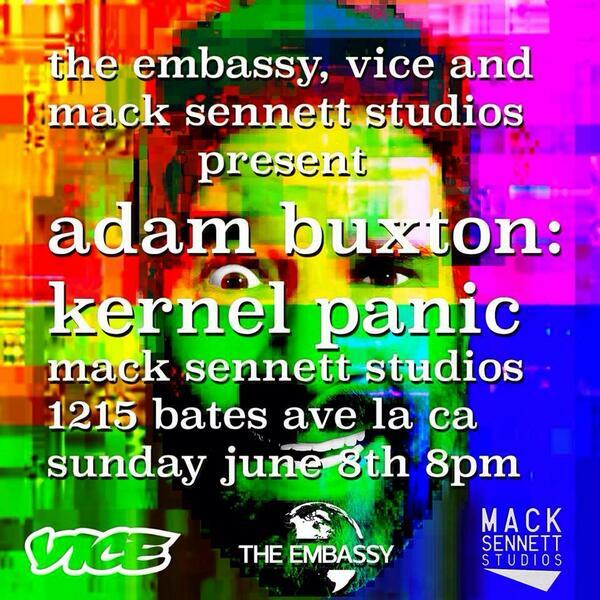 Sat 7th Jun – The Prompter at the Meltdown in L.A.
Sun 8th Jun – at the Mack Sennett Studio in L.A.
Thu 4th Sep – Work in Progress at London‘s Invisible Dot. Sun 14th Sep – Guesting on Pappy’s Flatshare Slamdown at Phoenix, London. Wed 17th Sep – Work in Progress at The Invisible Dot, King’s Cross, London. Thu 2nd Oct – Norwich is hosting the XL Recordings BUG Special in the Playhouse. Fri 3rd Oct – Norwich is hosting the XL Recordings BUG Special in the Playhouse. Wed 8th Oct – Work in Progress at The Invisible Dot, King’s Cross, London. Mon 13th Oct – Work in Progress at The Invisible Dot, King’s Cross, London. Tues 14th Oct – Work in Progress at The Invisible Dot, King’s Cross, London. Tues 29th Oct – BUG Special in Barcelona. Wed 19th Nov – BUG XL Recordings Special at The Phoenix, Leicester. Fri 5th Dec Kernel Panic Work in Progress in Kings Cross, London. Sat 6th Dec Live at The Chapel in Islington, London. Thu 17th Dec – Kernel Panic in Uckfield. Thu 18th Dec – Gittins To Know You in Brighton. Adam is on tonight’s bill.